A popular story has been floating around the mainstream media about a so-called “polypill”. It’s supposed to be the next “big thing” in treating heart disease. The pill in question combines several heart medications (aspirin, blood pressure medication and cholesterol lowering medication) in one easy to swallow tablet. This combo product isn’t on the market yet, but it will likely be available in the coming years. What you may not have heard on the nightly news is that there’s been some other promising developments in the world of cardiovascular disease management. The reason you probably haven’t seen these reports is because the “medicine” involved is actually a natural supplement that’s been on the market for many years. Alpha lipoic acid is a vitamin-like antioxidant that is produced by the body and found in certain foods. One of its primary roles is converting glucose into energy. But this unique antioxidant is involved in many secondary functions as well. Most antioxidants either work in water (vitamin C, grape seed extract, green tea) or fatty tissues (carotenoids, CoQ10, vitamin E). 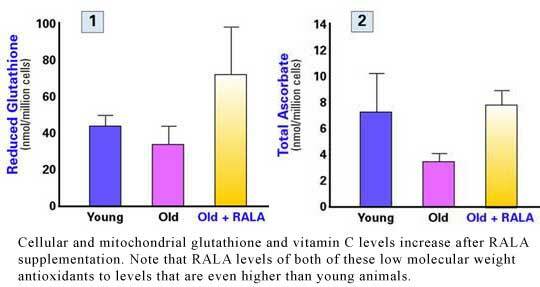 Alpha lipoic acid functions in both. This allows it access to every sort of tissue in the body. 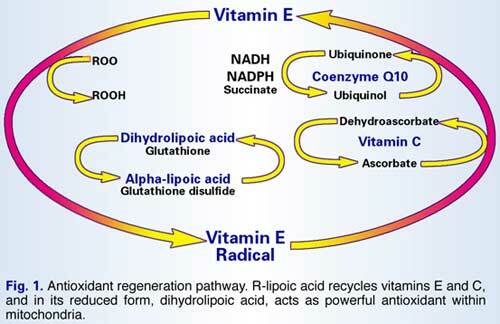 Another important trait of lipoic acid is its ability to help regenerate other antioxidants. It therefore allows the antioxidants that are eaten and taken as supplements to work harder and longer in the body. The most common conditions for which lipoic acid has been used are mostly related to diabetes and liver disorders. Lipoic acid is known to enhance blood sugar control by improving insulin sensitivity. Thanks to its anti-inflammatory effects, it’s also been shown to help with a painful diabetic complication called neuropathy (nerve damage). In addition, its powerful antioxidant properties seem to provide a protective effect in a number of liver diseases. Recently scientists have been experimenting with the use of alpha lipoic acid in a broader range of conditions. One such example was published in the February issue of the Archives of Biochemistry and Biophysics. Researchers from the Linus Pauling Institute at Oregon State University conducted a trial to evaluate the potential of alpha lipoic acid in lowering high triglycerides (a risk factor for heart disease). The lipoic acid appeared to hasten the clearance of triglycerides from the bloodstream. They also noted a decrease in triglyceride production in the liver. A December 2008 study found that lipoic acid could help lower cholesterol and lipid peroxidation, a process that contributes to plaque forming in arteries. The prior study lends even more support to an October 2008 review article which highlights alpha lipoic acid as a potential superstar in the management of hypertension (high blood pressure). I’d also like to point out that toxicity testing on lipoic acid has demonstrated a wide safety margin. The only “side effect” recorded was a drop in body weight for lab animals taking higher dosages. The same cannot be said for the individual components of the “polypill” much less the combination of these medications. There is one nutritional interaction of which I think you should be aware. Alpha lipoic acid has a chemical structure that is very similar to a nutrient called biotin. Biotin also serves many key functions in our bodies. In order to avoid any interference between the two, it’s probably best to take them at separate times of the day. In alpha lipoic acid we have a powerful antioxidant that may help to support several markers of cardiovascular health. In doing so it can also provide additional benefits ranging from combating Alzheimer’s disease and inflammation to depression and even protecting ocular (eye) health. I think it’s certainly something worth considering before reaching for any multi-drug tablet. I heard this was extremely good for neuropathy patients with diabetes. But I have multiple myeloma cancer. Please get back with me at your earliest convenience. First let me emphasize that I’m not a pharmacist or physician. Based on my preliminary review, it seems as though alpha lipoic *may* interact with some chemotherapeutic, diabetic and thyroid medications. Please check out the top three links. A recent review about diabetic neuropathy suggests the potential of alpha lipoic acid and benfotiamine as first line therapy options. These are both currently sold, in the USA, as nutritional supplements. My best advice, for your specific situation, would be to speak to your physician(s) or pharmacist about this. There is also an expert in the field of integrative oncology named Ralph Moss. I believe he offers telephone consultations – I’m not sure of the price however. I’m sorry that I can’t give you a “yes or no” answer here. Unfortunately, I’m simply not qualified to provide that kind of advice. I do wish you all the best. I hope the links I provided can be a starting point to assist you and your medical team. Another natural poly-pill = hawthorn + beetroot. And a hybrid poly-pill = alpha lipoic acid + low dose naltrexone. Thank you, Iggy. Ain’t nature grand? I take alpha-lipoic acid daily. However, in order to achieve the results that the folks at the Linus Pauling Institute acheived would cost be $1,800/day for that dose of R-alpha lipoic acid. I am now about to start my 3rd week on low dose naltrexone. Although I have prostate cancer, the reason I’m taking LDN is for my asthma. It seems to be working. The 1st 2 or 3 days on LDN I was able to come off all asthma medication. I’ve since had to take small doses of inhalant but it’s about 2/3 lesser dose. The only side effect was insomnia the 1st couple of nights. Now I sleep soundly but with vivid lucid dreams. You’d think I’d be exhausted after such dreams but I awaken fully rested. I also take the suggested co-nutrients such as CoQ10, alpha lipoic acid, acetyl-L-carnitine, NAC, and full spectrum vit E.
I buy the full size 50mg naltrexone pills. I crush 1 pill and dissolve it in 50 milli-liters of distilled water. I then use an infant syringe to measure out 4.5 milli-liters of the drug solution. I take the LDN at bedtime. Ten 50mg naltrexone pills cost $18.50 on the internet. Ten 50mg pills = 111 daily doses or about $5 per month. There is a $7.50 flat shipping charge. Effects of α-lipoic acid and eicosapentaenoic acid in overweight and obese women during weight loss. OBJECTIVE: To evaluate the potential body weight-lowering effects of dietary supplementation with eicosapentaenoic acid (EPA) and α-lipoic acid separately or combined in healthy overweight/obese women following a hypocaloric diet. METHODS: This is a short-term double-blind placebo-controlled study with parallel design that lasted 10 weeks. Of the randomized participants, 97 women received the allocated treatment [Control, EPA (1.3 g/d), α-lipoic acid (0.3 g/d), and EPA + α-lipoic acid (1.3 g/d + 0.3 g/d)], and 77 volunteers completed the study. All groups followed an energy-restricted diet of 30% less than total energy expenditure. Body weight, anthropometric measurements, body composition, resting energy expenditure, blood pressure, serum glucose, and insulin and lipid profile, as well as leptin and ghrelin levels, were assessed at baseline and after nutritional intervention. RESULTS: Body weight loss was significantly higher (P < 0.05) in those groups supplemented with α-lipoic acid. EPA supplementation significantly attenuated (P < 0.001) the decrease in leptin levels that occurs during weight loss. Body weight loss improved lipid and glucose metabolism parameters but without significant differences between groups. CONCLUSIONS: The intervention suggests that α-lipoic acid supplementation alone or in combination with EPA may help to promote body weight loss in healthy overweight/obese women following energy-restricted diets.